If you squint and tilt your head, Malcolm Turnbull and Julie Bishop standing in front of the press gallery following the successful spill of the Liberal leadership, looked enough likeHouse of Cards’ Claire and Francis Underwood to capture the imagination. In all the jokes jostling for attention that night, ‘Netflix and spill’ was repeated incessantly, so it was perhaps appropriate that a night worthy of prestige television, for Australian politics anyway, would have Turnbull figured as one of its stars. It was an image that captured the spirit of the night because it seemed to convey what many progressives were arguing about Turnbull: he might be charismatic, charming and well dressed, with a wife/deputy to match, but he’s still dangerous and ruthless, with (thankfully less literal) blood on his hands. In the moments leading up to and following the successful Liberal leadership spill, I was struck by how common it was to hear left-leaning commentators note their distinct preference for Abbott to remain Prime Minister over Turnbull. With Turnbull’s ascension came a recurring theme of warnings: do not be seduced by the Right’s new leader. Inevitably, then, to regard the ascension of Turnbull as a positive thing for Australian politics is to be placed amongst those who have been fooled, in blind thrall to a man who offers ‘a nicer suit’, but who underneath is just as nakedly conservative as Abbott. While there is no question Turnbull is a more elegant politician, there is some room for optimism around his instalment as leader, for reasons of substance far more than style. The parameters of any political debate are elastic, but to observe politics over the past two years was to watch them stretch ominously. The Abbott government was one that lurched to the right, even for a Liberal administration, in a way that was both unexpected and for which it had no mandate. These attempted policies, some of which were flatly broken election promises, have been endlessly canvassed, but principal among them were the cutting of funding to – and interference in – public broadcasters, the near undoing of our universal free healthcare system, the attempted deregulation of university fees, the changes to our rights to privacy, as well as the patently ideological policy which forced those who aren’t employed to wait six months to receive any welfare payment. These were huge, seismic shifts to the political debate, and were roundly rejected by the vast majority of the population, as 30 consecutive Newspolls confirmed. Fundamentally, the Abbott government reframed Australian politics. As evidenced in Labor’s lock-step adoption of most of the government’s foreign policy and immigration policies, for any party trying to win in the centre, occupying the middle ground meant being pulled further and further to the right. Watching on, politics corroded under Abbott’s influence, with the fight seeming to define him. From the minor biographical detail of his status as a boxing blue, to disputed claims of the punching of a wall near a woman’s head during university days; from his ruthlessness as an opposition leader, to the language he used while in office, threatening to ‘shirtfront’ an international leader, and even the compliment he bestowed on his chief of staff, ‘the fiercest political warrior I’ve ever worked with’. In office, he could never move on from the ruthless obstructionism that was so brutally effective in Opposition, and his strategy for governance continued to centre on keeping Labor out. Following the first attempted leadership spill in February, policystagnated entirely, over fear of further alienating the electorate, and destabilising his position within the party room. Indeed, his central pitch on the announcement of the final, fatal leadership spill was that ‘we are not the Labor Party’. The fight to retain office and fend off internal enemies appeared to be the motivating force of his political career, and in this sense it is ironic the extent to which it is Abbott, far more than Turnbull, who resembles the protagonist of House of Cards – a series which, even with all its Beltway finery, centres more on how to attain, wield and retain power, rather than any insightful exploration of White House politics or policy. In the short time since he has become Prime Minister, Turnbull has sought to remove the toxicity of the fight in politics. Sinodinos claimed, ‘I don’t think we should be hung up on the battles of the past, the battles of 2009.’ Gone is the pugilistic rhetoric, there are no wars on ‘visually awful’ renewable energy or descriptions of ‘vigilante litigation’, whole discussions of foreign policy can run without any mention of the ‘death cult’. Turnbull appears in a single stroke to have taken the mindless brawling out of public debate, avoiding the aggression of Abbott’s politics, and outlining his role as a leader who attempts to explain and persuade. ‘One of the things I'm trying to do is to change the paradigm so that it's a more rational one,’ Turnbull noted in one of his first interviews. This, of course, is an immediate change in style, but it does signal a change in substance too. Though a little more than a fortnight in is too early to have much of a legislative agenda, there have been positive changes to policy: $100 million Women’s Safety Package to begin action against domestic violence, as well as opening up discussions about economic reform, with negative gearing and super concessions now on the table. In his first conference following the spill, Turnbull also signaled shifts regarding infrastructure funding, which would not privilege roads over public transport. Then there are the changes to his ministry – symbolic yes but substantive too. The fact that it is remarkable to have more than two women in cabinet, or a woman as the Minister for Women, or the mere existence of a Minister for Science, shows the ultra-conservative state from which we have emerged. The flip side of this is the manner in which Turnbull has not fought. Burnt by his experience in 2009, where he directed his greatest fight inward, arguing in favour of a bipartisan position on Rudd’s Emissions Trading Scheme and ultimately losing the leadership to Abbott by one vote, we see a man who has fallen in. His initial press conference made two key policy positions clear – there was to be no change on climate policy, and no change on marriage equality – the two areas which marked him as a moderate within his party, and which situated him in higher esteem with many voters. As Abbott made sure to have on the record in his no wrecking, undermining or sniping radio interview series this week, ‘Protection policy, the same. Climate change, the same. Border protection policy, the same. National security policy, the same.’ In capitulating to the conservative arm of his own party, Turnbull has certainly been compromised. Though there is no doubt that issues such as climate change and marriage equality will be more seriously dealt with even within the constraints Turnbull has agreed to – there have been early suggestions that he will amend the measures to reduce carbon emissions if they’re not adequately hitting our targets. If Labor hold firm, this at least lends the possibility of a serious contest of approaches at the next election, in two party preferred terms. 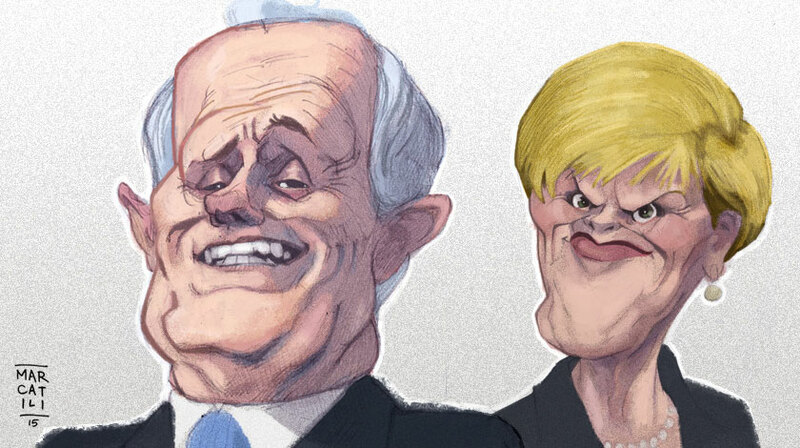 As a piece from Junkee, Why we should be more afraid of Malcolm Turnbull, demonstrates in particular – ‘His transition to the Prime Ministership might be the best thing to happen to the public image of the Coalition in decades. And that’s terrifying’ – Abbott is the preferred leader among many on the left precisely because of the parlous state to which he drove the Coalition, and as a consequence, the seeming inevitable success of Labor at the next election. Yet retaining a leader on the right, one who is not just vastly disliked but deeply ineffective and arguably damaging to politics as whole is not to the benefit of any party. Hoping for a terrible leader for the opposite side so the chances of implosion are greater are exactly the kind of fight for fight’s sake that has repelled so much of the electorate for much of the past decade. It is a partisanship that’s becoming increasingly irrelevant, and a conversation that centres again on an Underwoodian obsession with attaining power, rather than a genuine contest of ideas. To regard the ascension of Turnbull as a positive thing for #auspol is simply to acknowledge that of all the potential leadership options – namely Morrison, or the retention of Abbott – they have chosen a comparatively more progressive one, where the possibilities of bipartisanship are greater. It is more constructive and reasonable governance, undoubtedly, but it is Liberal governance still. If parties on the left are serious about better policy, not just the attainment of power, then the wish for a leader like Abbott is self-defeating. A government might be terrible enough to sweep themselves from power, but they still can destroy it in the three years they are there. The next government cannot hope simply to dismantle everything that was done before it, or they may end up with an alarming resemblance to Abbott, or even Underwood, too. Is there another way to fund the arts? While we may never all agree on how best to fund the arts but can we get to a point where we can discuss it rationally?